Thrilled to be the new Secretary General of the 2019 SPRIMUN edition, Solenn is a fourth-year student at Sciences Po Rennes, following a master’s degree in European and Global Affairs. She has been involved in MUNs since her arrival at university. She participated twice to both PragueMUN and SPRIMUN. She also had the pleasure to be the 2017 president of Science Po Rennes MUN society (BATNA), organizing many simulations and giving students the opportunity to take part in renown MUNs abroad as delegates. She just spent a year in Hong Kong Baptist University where she developed her knowledge of international relations at HK CityU MUN. She will make it her duty to offer you the best SPRIMUN ever. Gaïd is a fourth-year student at Sciences Po Rennes, starting a master’s degree in European and Global affairs. She spent her last year studying at Linnaeus University, in Sweden, and always had an interest for international affairs. With strong European citizen’s convictions forged by various experiences, she is committed to shaping a better EU. Her involvement in MUNs led her to take part in PragueMUN and SPRIMUN 2017 editions. As this year’s Delegate and Committee manager, Gaïd will be in charge of recruiting the chairs and preparing committees to ensure vivid and interesting negotiations. She will also make sure that all the delegates are properly registered, answering all questions on registration and committees. Marguerite’s interest in international relations and political sciences led her to integrate Sciences Po Rennes in 2015. She actively took part in Sciences Po Rennes MUN society (BATNA) simulations, and participated to PragueMUN 2017 edition. After studying a whole year abroad in Buenos Aires, Argentina, she is currently following a master’s degree in Multilevel Governance in International Relations. As the finance manager, Marguerite will ensure SPRIMUN 2019 will make the best of its resources to come out with an unforgettable event. Currently starting a master in European and Global Affairs and strongly interested in international relations and cooperation, Laurine just carried out an internship with UNV – United Nations Volunteers – at the UN Headquarters of Bonn. After a whole year abroad that gave her the chance to broaden her horizons, she sees SPRIMUN as great opportunity to keep a close eye on the world’s current challenges. Thanks to an internship with an environmental NGO in Canada where she was in charge of reaching out to partners, Laurine is all the more excited to be the new Partnerships Manager for the SPRIMUN 2019 edition. 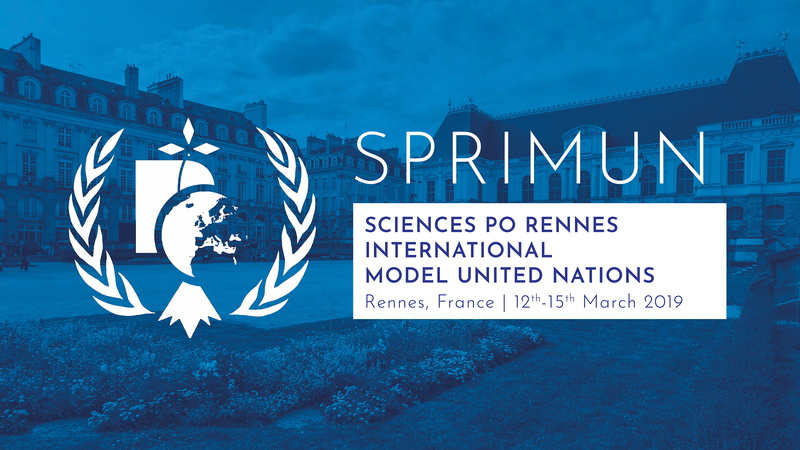 Currently a fourth-year student at Sciences Po Rennes, Mael participated to various simulations organised by Sciences Po Rennes MUN society (BATNA), and flew to the Czech Republic to take part in PragueMUN 2017 edition. He has strong interests in European affairs, international relations and geography. He spent a year abroad working for EUROCITIES, a Brussels’s based network for major European cities, dealing with sustainable urban development issues. Mael is currently studying for a master’s degree in European and Global Affairs, and wishes to pursue a carrier in the field of local and regional development of the EU. As the communication manager, he will make sure SPRIMUN gets the best visibility to attract young talents from all over the world. Marielle is a fourth-year student at Sciences Po Rennes. She participated once to PragueMUN and was the treasurer of Sciences Po Rennes MUN society (BATNA). After spending a year abroad in the University of Seoul, South Korea, she is now studying for a master’s degree in Management of Organizations and Projects. She will do her best to make sure you spend an awesome time in Rennes beside the simulations, during epic evenings and memorable parties. Currently a fourth-year student at Sciences Po Rennes where she is studying Law and Public Affairs, Marie-Astrid spent a year abroad in Sidney working with one of Australia’s leading human rights and civil liberties organisations, the NSW Council for Civil Liberties. Her interest in political and international studies led her to integrate the MUN society of Sciences Po Rennes (BATNA) in 2016 and to participate to several MUNs, including PragueMUN and, of course, SPRIMUN. As the director for logistics of this year edition of SPRIMUN, she is in charge of making sure the event goes smoothly for every participant.